Supports 7inch Props with the GoPro Session and any Micro Camera in the unique lower turret. Collaborated on every aspect of this frame with Colby Curtola, AKA SFPV. Colby wanted the ultimate long-range 6″ quad, and we spent countless hours hashing out every possible detail to make it a reality. WHO SAYS BIG FRAMES HAVE TO BE UGLY? Raggio was designed to be an efficient long range workhorse, but didn’t want to sacrifice function for form. 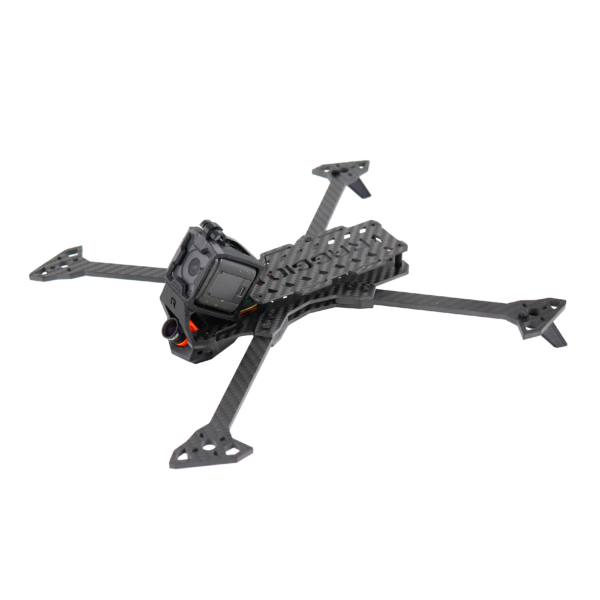 Raggio’s unique arms and camera mounts will make you proud to put the Raggio on your mantle after a hard day of flying. Imagine if a Lamborghini and a stealth attack helicopter had a baby; while that might be the stuff of beautiful nightmares, falconmultirotors think it would come out looking something like Raggio. 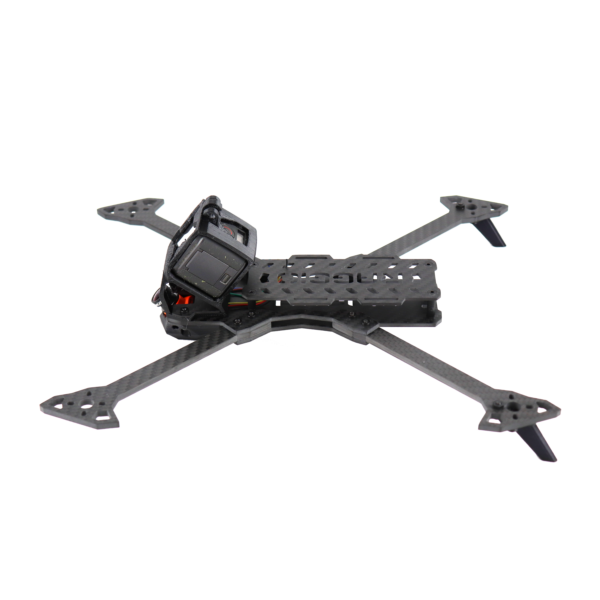 Although Raggio was designed specifically for the GoPro Hero 6 and 6″ props, falconmultirotors also offer a mount for the more common GoPro Session that enables 7″ props. With tear-resistant GoPro mounts that are printed on their side and a unique carbon plate sandwich that secures the TPU mount to the frame, your HD cam will never come off in a crash. ROOMY OR LOWRIDER, YOU CHOOSE. Raggio ships with both 15 and 20mm standoffs, so you can slam your build with an AIO board or go roomy for stacks that include larger components, such as the TBS PowerCube Elite. In both configurations, Raggio has ample room for a Unify and Crossfire, with no smashing or sandwiching required. Raggio supports 30.5mm FCs . Recommend using an AIO board to keep your stack low, maintaining the center of gravity of the design. As this frame was designed with long range in mind, you may want to consider using the Power Cube Elite Stack. This bundle allows for plug and play TBS GPS and comes with a TBS Unify Pro HV built in for those 800mW flights! Most 20-35A ESCs will mount cleanly on the arms with no overhang. When built with the included 20mm standoffs, there is plenty of room in the center fuselage for a 4-in-1 ESC / FC stacks. Our recommended set up is a low kV motor running 6S LiPo, so make sure your ESC’s are 6S capable. Suggest using VHB between the ESC and the arm, then adding heatshrink to secure the ESC to the arms (leaving the motor pads accessible in case you need to swap motors). The ideal set up for long range rigs are lower kV motors that will pull less amps and give you plenty of flight time to reach the mountain top. The Raggio was designed to carry a longer battery than people are used to with those super light race frames. Raggio is designed to mount the battery on the top, with slots for two battery straps giving you that extra bit of confidence that your battery will stay snug. There is plenty of width on the top plate for those fat 6S batteries that most top pilots are running on their long range rigs. Go Crossfire or failsafe trying. Raggio was designed around the RunCam Micro Swift (Version 2 or 3), and the Foxeer Micro fits as well. Recommend using the TBS Unify Pro HV, due to its unrivaled reliability and ability to run at 800mW. Zypher V3 NEW! 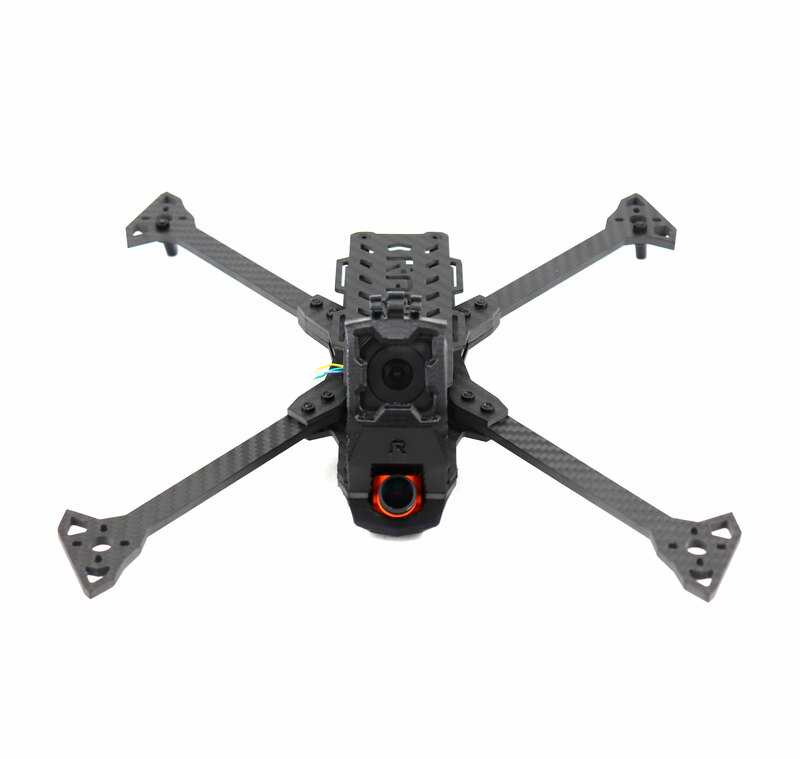 5.5″ Prop design with 4mm Carbon Race Design!